In the days before 2000 when ethics laws trickled down to local governments, limits on lobbying and lubricating private agreements off the record have decreased, partly in conjunction with Freedom of Information request laws. This decline in expense account dining and wining hurt the merchants of entertaining, but meals like this one have continued whenever there is an event that a group wishes to celebrate (enkai): the end of a project, the welcome (kangei-kai) or farewell (sobetsu-kai) of a guest, and so on. Since 2015 okra in various forms became ubiquitous and 10 or 15 years earlier broccoli was a new ingredient in the side dishes. Probably in the 1970s asparagus was similarly a novelty. 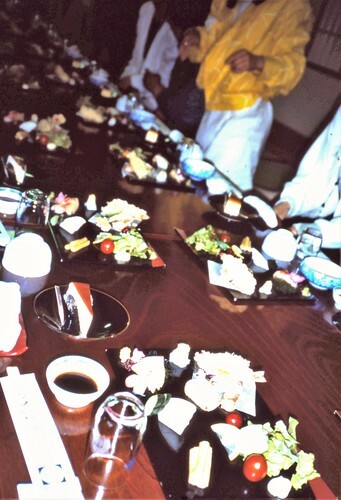 This photo documents some of the ingredients as of 1989 that comprise a set meal prepared in advance for a group event.